As we sang these words, I couldn’t help but picture someone wondering about the “curtain” in these lyrics. The beautiful imagery and powerful message of this song was lost without context. 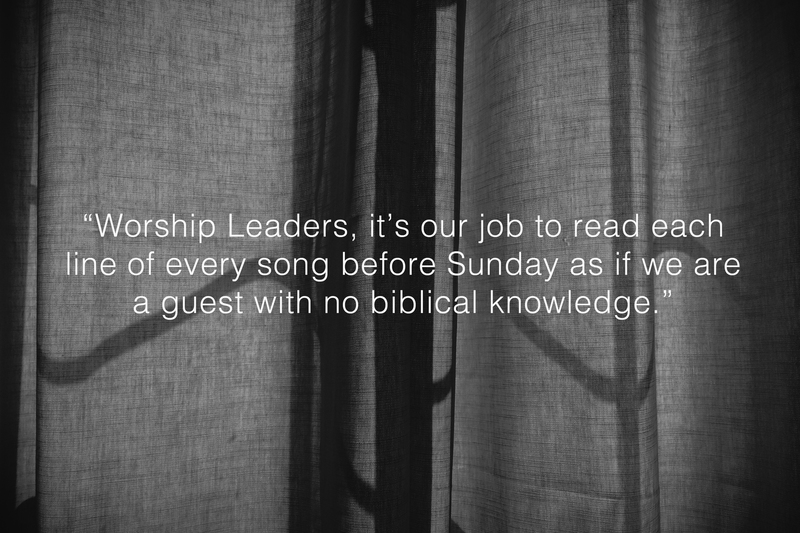 This is why Worship Leaders need to be Theologians. It’s our job to read each line of every song before Sunday as if we are a guest with no biblical knowledge. These great lyrics come to life when we sing them in the context of Hebrews 10. And so, dear brothers and sisters, we can boldly enter heaven’s Most Holy Place because of the blood of Jesus. By his death, Jesus opened a new and life-giving way through the curtain into the Most Holy Place. In hindsight, I should have started the song by having the congregation read this passage together. Then briefly explain how a temple curtain separated people from God’s very presence. This curtain represents our sin, which acts as a great chasm between God and man. What Jesus did by sacrificing himself on the Cross obliterated our shame and guilt, and made it possible for us to boldly enter into the very presence of God without fear or condemnation. There is nothing that stands between us and God, we have direct access to Him through Jesus. Scripture: Read a scripture and show how it ties to a particular song. Have the congregation read a passage together or responsively as you underscore with music. Project Bible verses on the screens during musical interludes or transitions. Note: If you can’t find a scripture to support a song… you probably shouldn’t do the song. Define unusual words: We can’t assume that people know what words such as Hallelujah, Holy, or Amen mean. If you are going to sing words that aren’t part of everyday vocabulary, take time to define them. This can be as simple as a note on the bottom of the screen explaining the definition of a word. Ex. Hallelujah: God be praised. I am not advocating for the watering down or removal of deep biblical truths and mysteries from our singing. I am asking for us to work harder, myself included, at interpreting them for our churches.